The Jordan Aquifer Stakeholders Report has been published. This annual report covers Jordan (Cambrian-Ordovician) aquifer water use information, rules, and program changes from last year (2017). The information was compiled by the IDNR Water Use Program staff from information received from Jordan aquifer water use permittees. For the first time since detailed records began, annual statewide water withdrawals from the Jordan aquifer exceeded 25 billion gallons. A statewide total of 207 active Jordan water use permittees used 351 wells. This is a slight decline in the number of permits, and a slight increase in wells compared to the previous year. Seven new Jordan water use wells were drilled in 2017. Two for public water supplies, five for ag-industries. A total 39 Jordan aquifer water use permits were renewed, modified, or updated last year. Complete water level information was received from 260 Jordan aquifer wells (75% of total). Two new permits are at the Tier 2 rule level based on submitted pumping water levels. Please review this annual report for more detailed information. 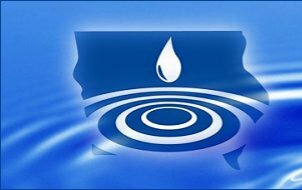 You are receiving this message as part of the Iowa Department of Revenue’s ongoing effort to educate businesses and organizations about the state’s new Water Service Excise Tax (WET). 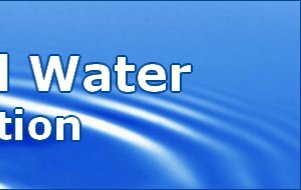 Water utilities must separate WET from sales tax for collection and remittance to the Department beginning July 1, 2018. However, in order to provide water utilities with time to make necessary programming changes, water utilities do not have to itemize WET on bills and receipts to customers prior to January 1, 2019. Beginning on January 1, 2019, WET must be separately itemized and stated on all bills and receipts, and must be identified separately from any other taxes collected, if any. The Department will not monitor how water utilities decide to separately collect and remit WET prior to January 1, 2019. Additional information about the Water Service Excise Tax is available on our website. Stanhope had a great showing from residents interested in making their own rain barrels at the Rain Barrel Workshop on Thursday April 26, 2018. 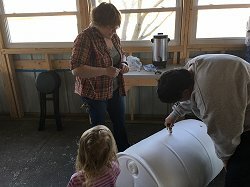 With a grant from the Stanhope Development Group and collection of free barrels through the Iowa Waste Exchange, residents paid a small fee and rolled away with their own rain barrel. 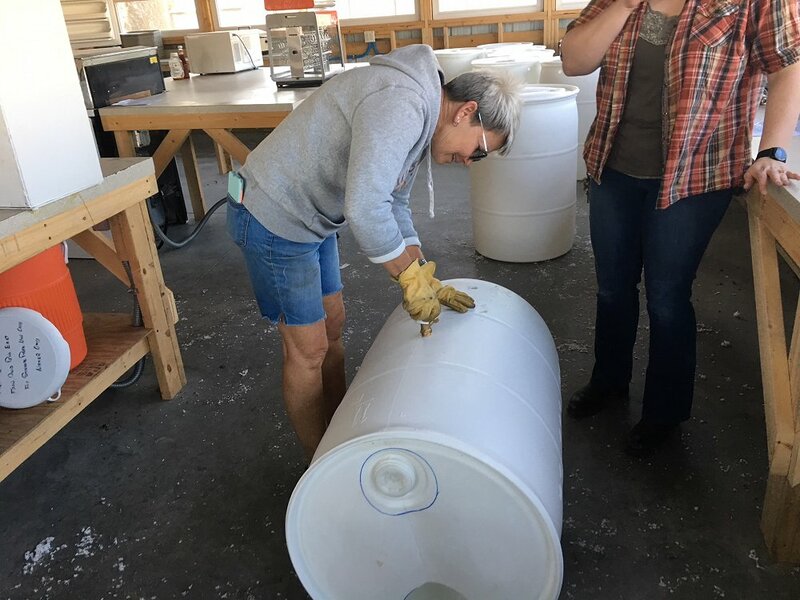 Over twenty – 55 gallon barrels were constructed and will soon be collecting rain water. This will help store storm water for later use and reduce treated water consumption for irrigation. This was truly a locally driven event, involving several city council members and city staff to set up the workshop and carry it out. This workshop was so successful that Stanhope hopes to hold another one real soon. City council member Nila Zanker puts some muscle into the construction rain barrels in Stanhope. Stanhope City Clerk Jessica Murray instructs a resident on how to assemble their rain barrel. Approximately 62 fifth grade students and their teachers and chaperones from Nodaway Valley Elementary School, Orient Macksburg Elementary School and some home-schooled students arrived at 8:20 am on Tuesday, April 24, for the 14th annual consecutive year of the Conservation Education Field Day for fifth graders. 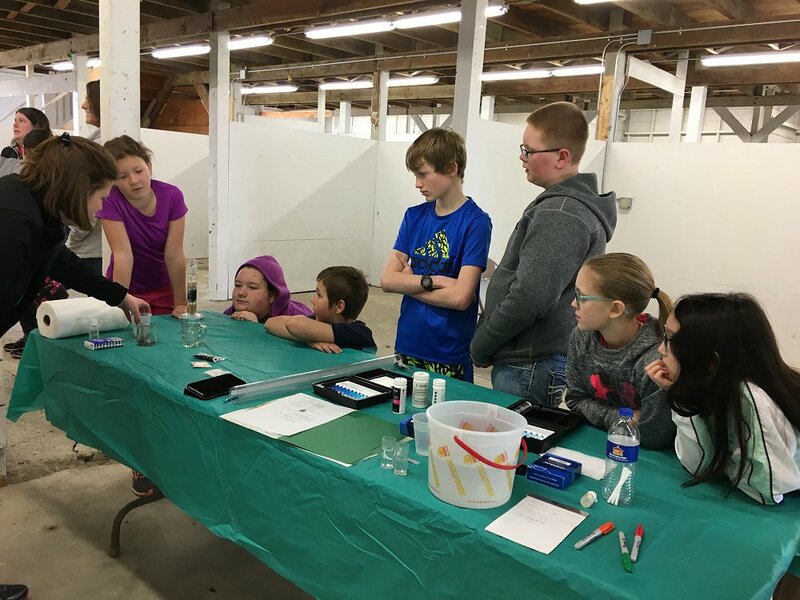 Lisa Walters, Iowa Association of Rural Water Specialist, showcased water quality education by discussing the importance of chemistry and inquisitive minds. The students were given the opportunity to actually test different water samples for nitrites, phosphates, oxygen, pH and sedimentation. 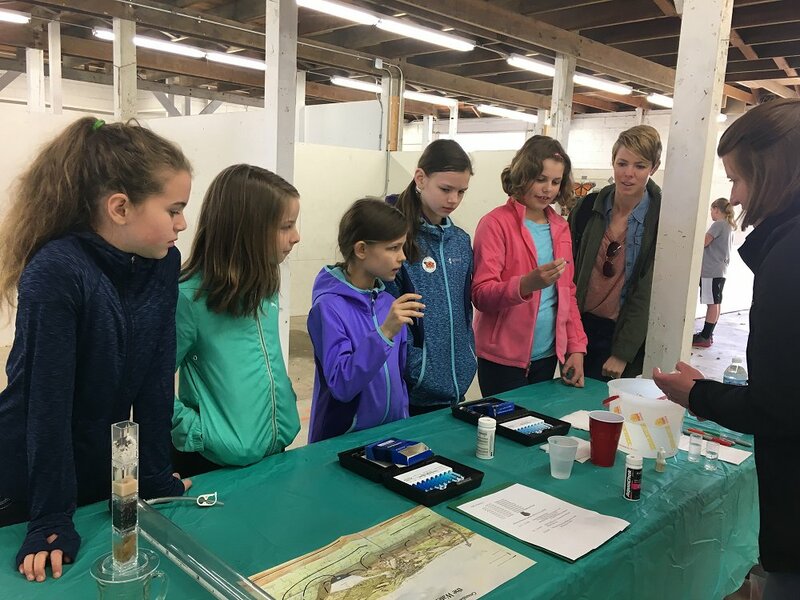 Lisa discussed the effects that each of these chemicals has on our natural water sources and how the balance of nature is affected in each of these environments. 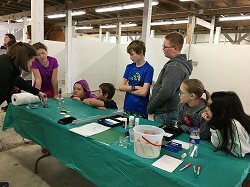 She also showed the students, using a water filtration model, the process of cleaning water through several filters to make it safe to drink. This illustrates one of the processes that municipal supplies use to provide safe drinking water. 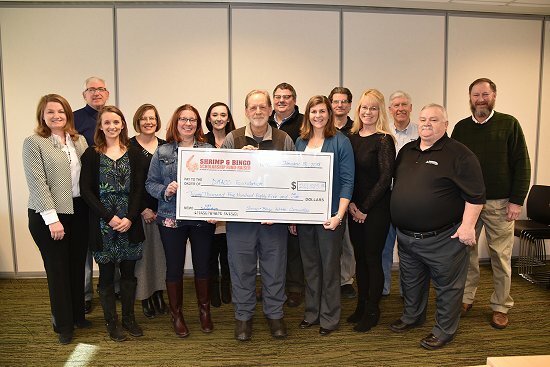 The sixth annual Shrimp and Bingo Scholarship Fundraiser raised $20,585 for the Des Moines Area Community College (DMACC) Foundation to fund DMACC Water Environmental Technology (WET) program scholarships for students. Over the past six years, more than $115,000 has been raised in this annual fundraiser. A total of 165 students have received scholarships from this fundraiser over the past six years. People from the water and wastewater treatment industry, DMACC employees, including President Rob Denson and students in the program, attended the annual event last August. They enjoyed a meal of shrimp, andouille sausage, with side dishes and great desserts, played bingo and won great prizes. More than $4,000 worth of prizes were given during the event, including $250 worth of beef and pork raised by the DMACC Ag Department, tickets to a gourmet dinner prepared by DMACC Iowa Culinary Institute™ students, two tickets to an Iowa State University football game, an Iowa Getaway package, atool set, gift certificates of various amounts, and numerous smaller gift certificates. The water and wastewater industry needs highly skilled workers to keep pace with the demand to modernize; as well as the numerous employees in the profession approaching retirement age. Planning is already underway for this year’s Shrimp and Bingo event to be held Saturday, August 25, 2018. AMES, Iowa — A study conducted by the Center for Agricultural and Rural Development at Iowa State University explores the potential economic benefits to drinking water, recreation and health through meeting the targets of Iowa's statewide strategy for reducing nutrients. The study highlights that reducing nitrates and improving water quality in rivers and lakes would increase recreation benefits, and may reduce adverse health outcomes for people exposed to high nitrates in drinking water. The study was led by Chuan Tang, a postdoctoral researcher, and Gabriel Lade, assistant professor of economics, along with: David Keiser, assistant professor of economics; Catherine Kling, director of the Center for Agricultural and Rural Development and a Charles F. Curtiss Distinguished Professor of Agriculture and Life Sciences in the Department of Economics; Yongjie Ji, an assistant scientist; and Yau-Huo Shr, a postdoctoral researcher. 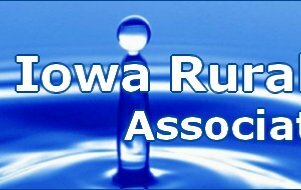 In 2012, the Iowa Department of Agriculture and Land Stewardship, the Iowa Department of Natural Resources, and Iowa State University College of Agriculture and Life Sciences developed the Iowa Nutrient Reduction Strategy. As part of a broader strategy among the 12 states that border the Mississippi River, the Iowa strategy lays out a science-based framework for reducing nutrient delivery to waterways in Iowa, and ultimately, the Gulf of Mexico. The strategy's overall goal is to reduce the amount of total nitrogen and phosphorous leaving the state by 45 percent. According to the Iowa State researchers, meeting the Nutrient Reduction Strategies targets will lead to substantial benefits to Iowans. Approximately 90 percent of Iowans rely on public water supplies for drinking water, while the remaining 10 percent rely on private wells. To assess the effectiveness of drinking water nitrate removal and its associated costs, the researchers compiled data from the Iowa groundwater quality monitoring program, the Statewide Rural Well Water Survey, the Environmental Protection Agency and other sources. They also interviewed several public water supply system operators. The researchers found that, since 2007, more than 90 percent of public water supplies were in compliance with all health-based drinking water standards. However, many utilities dedicate substantial financial resources to removing nitrates. The study found that 49 public water suppliers serving more than 10 percent of Iowa's population treat water for nitrates either by blending waters or using nitrate removal equipment. Also, Iowa's public water supply systems had invested at least $1.8 million in nitrate treatment equipment since 2000. "Nitrate removal equipment can be cost prohibitive to some small communities, leaving them with few options to meet federal safe drinking water standards," said Lade. "When we looked at data on private wells, which are not regulated by the EPA as public supplies are, evidence shows that as few as 7 percent and as many as 25 percent may contain unhealthy nitrate levels." The researchers also studied benefits to recreation in Iowa. They estimated that improving the quality of Iowa's lakes by meeting the targets would increase recreational benefits to all Iowans by approximately $30 million per year. "We also noted that harmful algal blooms linked to excess nutrients have become more of a problem in recent years, which further diminishes recreation values and potentially threatens the health of recreation lovers," said Lade. The study compiled much of the available evidence to date on health impacts of nitrates in drinking water. Public health scientists have long documented the health risks to infants drinking water with high nitrates. Other studies suggest that long-term exposure to nitrates in drinking water, even at low levels, may be associated with chronic health effects. "More research is needed to further study nitrate exposure and health outcomes, and especially in understanding the complex interactions between nitrates and other potential contaminants on human health," said Lade. "But to the extent nitrates in drinking water have adverse health impacts, we believe there are significant benefits in meeting the Nutrient Reduction Strategy targets in likely reducing Iowans' exposure and reducing healthcare expenditures." The study was funded by the Walton Family Foundation, the Iowa Environmental Council and the U.S. Department of Agriculture's National Institute for Food and Agriculture. The National Rural Water Association, the nation’s largest water utility association with over 31,000 members, announced the creation of the NRWA Workforce Advancement Center today during a joint ceremony with the Oklahoma Rural Water Association at NRWA’s headquarters in Duncan, Okla. The Center will develop the WaterPro Apprenticeship Program, a nationally recognized standard that will be registered with the U.S. Department of Labor. NRWA State Affiliates will jointly make the announcement at training events for water and wastewater operations specialists in California, Oklahoma, Tennessee, Indiana, West Virginia and New York. The announcement and events will commemorate National Apprenticeship Week 2016 and will highlight the need for a national water sector apprenticeship initiative. It takes over 380,000 highly skilled water and wastewater personnel to ensure the public supply of safe drinking water and to protect our lakes, streams and groundwater. Advancements in water treatment and supply technology have increased the skills and training required of this workforce. Water professionals are ultimately responsible for meeting stringent regulatory standards, replacing aging infrastructure, recruiting and training new operations specialists, and responding to and recovering from disasters. In addition to increasing professional demands, utilities will soon be forced to replace many of their most experienced employees. Between 2010 and 2020, the water sector is expected to lose between 30 and 50 percent of the workforce to retirement. Many of these employees have worked at the same utility for the majority of their careers, and they will depart with decades of valuable institutional knowledge. NRWA and State Affiliates currently provide training on operator certification, financial sustainability, environmental compliance, utility management and governance to 80,000 water professionals annually in all 50 states. Last year, over 55,000 on-site consultations were delivered by NRWA’s technical experts for water quality, energy efficiency, source water protection, technical assistance and emergency response. Today’s announcement furthers NRWA’s commitment to developing and enhancing the professionalism of the water sector workforce. The WaterPro Apprenticeship program will initially be tailored to water system operations specialists, wastewater system operations specialists, and water utility system customer service personnel. In addition, the NRWA Workforce Advancement Center will develop career pathways into the water sector for high school students, establish industry training certifications, connect workers with employers through a job network, and serve as an online clearinghouse for resources. To support this initiative or obtain further information, contact NRWA or visit www.nrwa.org. Remember the drinking fountain, that once ubiquitous, and free, source of H2O? It seems quaint now. Instead, bottled water is everywhere, in offices, airplanes, stores, homes and restaurants across the country. We consumed over ten billion gallons and purchased $12.3 billion of the stuff in 2013. Bottled water is currently the No. 2 beverage product and is expected to overtake soda as America’s most consume beverage in the next decade. It’s refreshing, calorie-free, convenient to carry around, tastier than some tap water and exponentially healthier than sugary sodas. Evocative names and labels depicting pastoral scenes have convinced us that the liquid is the purest drink around. But is bottled water and the package it comes in, safe, or at least safer than tap water? Analysis of industry data released in 2010 by the national consumer advocacy group Food & Water Watch found that almost half of all bottled water sold in U.S. retail outlets in polyethylene terephthalate (PET) plastic bottles now comes from municipal tap water supplies. “Bottling Our Cities’ Tap Water” shows that between 2000 and 2009 the share of retail-sold PET bottled water that is actually tap water grew from 32.7 percent to 47.8 percent (http://documents.foodandwaterwatch.org/doc/MunicipalWater-IssueBrief.pdf). Yes, some bottled water comes from sparkling springs and other pristine sources. Almost 50 percent of it comes from a municipal supply. The water is treated, purified and sold to us, often at a thousandfold increase in price. Most people are surprised to learn that they’re drinking glorified tap water, but bottlers aren’t required to list the source on the label. Water Quality: Is Bottled Water Safe? The FDA regulates bottled water as a food. That means it regulates allowable levels of chemical, physical, microbial and radiological contaminants, requires Good Manufacturing Practice standards for boiling and bottling, and regulates labeling. 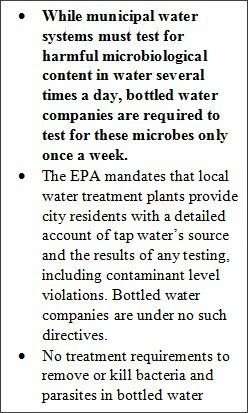 However, the FDA doesn't have the ability to oversee a mandatory testing program like the EPA does with public water suppliers. So, although it can order a bottled water recall once a problem has been found, there is no guarantee that the bottle of water you bought is safe. FDA's rules exempt many forms of what most of us would consider bottled water from its definition of "bottled water," and therefore, according to FDA, exempts them from all of FDA's specific standards for bottled water testing and contamination. If the product is declared on the bottle ingredient label simply as "water," or as "carbonated water," "disinfected water," "filtered water," "seltzer water," "soda water," "sparkling water," or "tonic water," it is not considered "bottled water" by FDA. In addition, FDA oversight doesn’t apply to water packaged and sold within the same state, leaving some 60 to 70 percent of bottled water, including the contents of watercooler jugs, free of FDA regulation. In this case, testing depends on the states, but often state primacy agency don’t have adequate resources either to oversee bottled water. Laced into plastic bottles are chemicals, such as bisphenol A (BPA), antimony, and benzyl butyl phthalate (BBP), potential hormone disruptors and di(2-ethylhexyl)phthalate (DEHP), a possible human carcinogen, that can seep out and into the water if bottles are exposed to heat, light or sits around for a long time. And because the plastic is porous, you'll likely get a swill of harmful bacteria with each gulp if you reuse the bottles. Water Quality: Is Tap Water Safe? You need to stay hydrated -- that’s clear -- but is the tap water in your home safe? It is considered generally safe if it comes from a public water system in the United States, such as one run and maintained by a municipality. The Environmental Protection Agency (EPA) has the authority to monitor all public water systems and sets enforceable health standards regarding the contaminants in drinking water. By July 1 of each year, public water suppliers are required to mail their customers a drinking water quality report, sometimes called a consumer confidence report or CCR. The report tells where your water comes from and what’s in it. It is hard to argue the fact that waste management has become a large problem in the world, with landfills growing to enormous sizes and recycling rates remaining dismally low. The number of plastic bottles produced by the bottled water industry and subsequently discarded by consumers has only exacerbated this problem. Bottled water produces up to 1.5 million tons of plastic waste per year. According to Food and Water Watch, that plastic requires up to 47 million gallons of oil per year to produce (foodandwaterwatch.org/water/bottled). And while the plastic used to bottle beverages is of high quality and in demand by recyclers, over 80 percent of plastic bottles are simply thrown away. Then there’s the waste of water itself, says Todd Jarvis, PhD, associate director of the Institute for Water and Watersheds at Oregon State University. 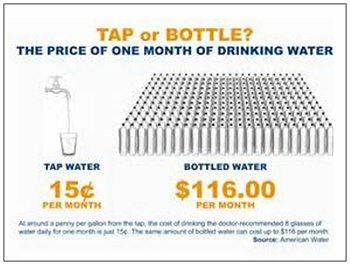 According to his calculations, it takes about 72 billion gallons of water a year, worldwide, just to make the empty bottles (http://www.rd.com/health/wellness/rethink-what-you-drink/4/#ixzz3ZrwjfCso). Besides the sheer number of plastic bottles produced each year, the energy required to manufacture and transport these bottles to market severely drains limited fossil fuels. Bottled water companies, due to their unregulated use of valuable resources and their production of billions of plastic bottles have presented a significant strain on the environment. Many people drink bottled water because they don't like the taste of their local tap water, or because they question its safety. In the documentary film "Thirst," authors Alan Snitow and Deborah Kaufman demonstrated the rapid worldwide privatization of municipal water supplies, and the effect these purchases are having on local economies. Water is being called the "Blue Gold" of the 21st century in the documentary title as such by Maude Barlow and Tony Clarke. Thanks to increasing urbanization and population, shifting climates and industrial pollution, fresh water is becoming humanity's most precious resource. There's a simple alternative to purchasing bottled water: buy a stainless steel thermos, BPA free bottles and use them. Don't like the way your local tap water tastes? Inexpensive carbon filters will turn most tap water sparkling fresh at a fraction of bottled water's cost. Local food is everywhere these days: community-supported agriculture (CSAs), farmers markets, farm-to-table dining… . That local food is grown and cooked with … local water! It’s the invisible part of the sustainable, healthy food you eat. So, become a locavore, it’s time to get your hydrophilia on and appreciate your local water supply just as much as you do your local farmers market. Shouldn’t we care for and support our water sources like we support healthy, organic, local farms? Tap water is clearly the safest, healthiest and most sustainable choice. Get your community to drink their tap water, you get people to value the source, the utility and the professionals that bring it to them. Drink local my friends, Cheers!